This L-Size Quadra sink tap is a distinct and characteristic appearance in your bathroom, with its round valve body and angular, sleek and curved spout. Complemented with its distinctive Quandra handle with triangular recess. 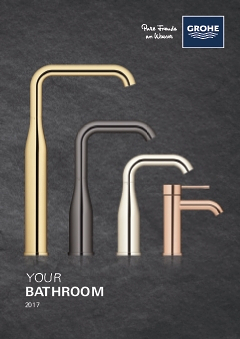 The tap has been made with shiny GROHE StarLight chrome and is an absolute eye-catcher in your bathroom. The tap has been outfitted with a concealed up-waste on the rear and GROHE SilkMove, so ease of use is guaranteed. The sink tap is easy to install thanks to the GROHE QuickFix, specially made and designed for quick and easy assembly.